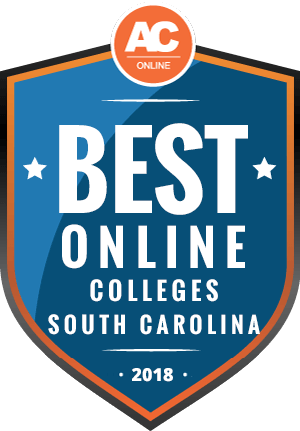 Why Choose South Carolina for Online Higher Education? According to the Lumina Foundation, by 2020, about 62% of jobs in South Carolina will require some sort of postsecondary education. The foundation also found that 34% of jobs in the state will require an associate degree or vocational certificate, 19% will require a bachelor’s, and 9% will require a master’s or higher. As of 2016, only about 9% of South Carolinians held an associate degree and 17% held a bachelor’s degree, according to the U.S. Bureau of Labor Statistics. Working South Carolinians may opt to earn college degrees through online education. This guide explores the most affordable online colleges in South Carolina, and offers answers to frequently asked questions, plus resources for people seeking relatively low-cost online universities in South Carolina. With 70 online degrees in South Carolina, prospective students may take advantage of several options. Many students opt to study online — single parents, working professionals, and underserved populations included. Over 9,000 undergraduate and graduate students pursue degrees in South Carolina, as outlined in the chart below. The chart displays 2016 data from the National Center for Education Statistics’ Integrated Postsecondary Education Data Systems (IPEDS) database. Colleges often list two different tuition rates: a higher rate for nonresident students, and a lower rate for in-state residents. As such, South Carolina students who attend college in-state typically pay less than those who choose out-of-state colleges. Students can prove their residency through a selection of documents, including a South Carolina driver’s license or income tax documentation. In some special cases, South Carolina students may receive reduced tuition rates in their neighbor states of Tennessee, Georgia, and North Carolina. The data below shows average tuition rates for out-of-state and in-state students in South Carolina. South Carolina’s in-state tuition rates fall much lower than the national average. During the 2015-2016 school year, the state’s average tuition rate for public four-year schools totaled just over $19,000. Typically, private colleges cost the most, followed by public four-year universities and then two-year associate colleges. In South Carolina, the cost of online classes does not differ much from the cost of on-campus courses. The private Limestone College, for instance, offers equal price tags for online and on-campus classes. Some on-campus courses, however, require lab or equipment fees, while online courses usually ask for an online course fee. Individuals who want to enroll in an online program in South Carolina, but who live out of state, may need to do some extra research. The IPEDS data in the chart below shows that nearly 1,700 non-South Carolina students studied exclusively online at South Carolina schools. Nonresident tuition often exceeds resident tuition, but students may find reciprocity agreements or good neighbor discounts between states that allow them to study with in-state tuition rates. As a member of the Southern Regional Education Board (SREB), South Carolina is in the same group as Alabama, Arkansas, Delaware, Florida, Georgia, Kentucky, Louisiana, Maryland, Mississippi, North Carolina, Oklahoma, Tennessee, Texas, Virginia, and West Virginia. The SREB offers a special program called the Academic Common Market, which allows students from these states to study at colleges in other member states — without paying extra nonresident tuition prices. The Academic Common Market includes over 1,900 undergraduate and graduate programs. To find out if a program qualifies for this tuition discount, check the SREB website. When researching online degrees in South Carolina, pay attention to the state authorization for online learning. South Carolina participates as a member of the National Council for State Authorization Reciprocity Agreements (NC-SARA). Meaning any South Carolina academic program approved by NC-SARA holds validity in other NC-SARA states, and that students can complete the in-person activities required by online programs, like nursing practicums, even if they live out of state. NC-SARA includes all states except California and Massachusetts. This ranking lays out some of the best and most affordable online programs in South Carolina. These rankings account for a combination of affordability and quality. All ranked schools meet at least the following minimum requirements: accreditation, at least three online associate degree offerings, at least three online bachelor’s degree offerings, annual in-state tuition below $5,000 for two-year schools, and annual in-state tuition below $25,000 for four-year schools. We then considered several other factors, including average in-state net price, student-teacher ratio, the percentage of undergraduates receiving financial aid from their colleges, the average amount of financial aid students receive, the availability of academic and career counseling services, and the availability of job placement services. Read on to discover the best school for you. If you still have questions about online colleges in South Carolina, we have listed FAQs below, and provided information and resources. Read on to learn more. Do online credits cost more or less in South Carolina? Tuition cost depends on the school. When it comes to tuition itself, online degrees typically cost about the same as on-campus degrees. Sometimes schools add extra distance education tuition fees for online courses. At Anderson University, both online course credits and on-campus course credits cost the same; however, each online course requires an extra $10 distance learning fee. The same rules apply at Limestone College, where lassroom courses cost the same as internet courses. On-campus courses often demand laboratory or material fees that distance learning students do not need to pay. Trident Technical College lists these additional fees. For instance, on-campus dental students must pay an additional $75 for each course. On top of that, traditional students attending courses on-campus need to pay costs unrelated to tuition. Clemson University requires an activity fee, campus rec fee, and health fee, among others — costs that online students can avoid. Which South Carolina schools accept the most transfer credits? Transfer credit policies depend on both the school and the academic program. Schools often evaluate transfer credits on a case-by-case basis, meaning the answer varies for every unique student depending on his or her academic background and chosen program. If you intend to transfer credits to either of South Carolina’s two largest public research universities, Clemson University and the University of South Carolina (UCS), both of which offer online programs, consult Clemson’s transfer course equivalency list or USC’s transfer course equivalency table. Take note: USC does offer several online bachelor’s degree completion programs. Students who enroll in these programs can bring in 45 prior credit hours from regionally accredited higher education institutions. This allows them to graduate in 2 to 2.5 years. South Carolina State University (SCSU) operates as another public research university in Orangeburg. SCSU also accepts transfer students, as long as transfer students complete 30 credits of coursework at SCSU. Some schools offer transfer credit for real-world and professional experience. North Greenville University, for instance, allows students over the age of 22 to transfer up to 12 such credits for its business and leadership bachelor’s degree. Will any online colleges in South Carolina accept a GED? Several accredited online schools in South Carolina accept GEDs. Online programs in South Carolina aim their courses at nontraditional learners, since these schools understand college students come from different backgrounds. Some students, for instance, opt to earn their GED instead of a high school diploma. For example, North Greenville University allows undergraduate students applying for NGU programs online to apply with their GED if they do not possess a high school diploma. At Anderson University, applicants may send in either their high school diplomas or their GED scores. Limestone College allows candidates to apply whether they possess a high school diploma, GED, or GED equivalent. Francis Marion University allows students to apply with a GED if they include a letter of intent explaining their circumstances. How many academic terms per year do online colleges in South Carolina offer? One of the advantages of online colleges in South Carolina — and online programs in general — involves scheduling flexibility. Distance learning programs follow a design specifically for working adults, student parents, and nontraditional students with other commitments. Sometimes, online courses allow for shorter terms and more frequent start dates throughout the year. A handful of online schools around the country allow students to begin their degrees every month, or even every week. However, most online programs in South Carolina do not start that frequently, but still follow a much faster pace than traditional degree paths. Take North Greenville University, for instance. The online terms last eight weeks, meaning students can start every two months rather than waiting for the traditional fall and spring semesters to start. At Anderson University, the Flex Degree program allows students to start and work through courses at their own pace. Learners can finish one class in 5-7 weeks. At Limestone College, students can begin the eight-week courses at six different start dates throughout the year. Claflin College also offers courses lasting eight weeks. Which online colleges in South Carolina will accept the FAFSA? All students should fill out the Free Application for Federal Student Aid (FAFSA), regardless of which online colleges in South Carolina they hope to attend. The FAFSA determines whether you can earn federal financial aid through grants, loans, and work-study programs. Applicants can easily fill out the FAFSA online. In addition to the federal government, online schools in South Carolina sometimes use the FAFSA to determine whether students qualify for student aid. The online programs at North Greenville University, Anderson University, Clemson University, Limestone University, Columbia International University, the University of South Carolina at Columbia, Southern Wesleyan University, Lander University, Charleston Southern University, Coastal Carolina University, Claflin University, Francis Marion University, the University of South Carolina – Upstate, and the Medical University of South Carolina all require students to fill out the FAFSA. Two-year associate degree colleges do, too. These schools possess a six-digit FAFSA code; once you complete the FAFSA, enter the school’s code to send your FAFSA information to your chosen college. Are there any free online classes I can take from South Carolina colleges? Generally, no. Online colleges in South Carolina charge tuition costs for courses students take for credit. Even community courses or continuing education courses — classes that do not count for college credit — typically demand an enrollment fee. For instance, USC in Columbia offers courses like sign language and graphic design to community members. But the school still charges $120 for sign language classes and $35 for graphic design classes. Students may bypass these fees, however, if they qualify for financial aid or scholarships. If you want to find free online classes, you can take advantage of schools outside of South Carolina. Keep in mind, you do not receive credit for these courses; they simply contribute to your personal growth. To name a few examples, Harvard University offers free online open learning courses through its extension school. You can learn about the Ancient Greeks, the science of cooking, or abstract algebra. Stanford University operates a similar program, with courses covering topics like space mechanics, the spirit of entrepreneurship, and genetic engineering. Even if you live in South Carolina, distant learning can give you access to open learning courses based elsewhere. How can I find the online program options at South Carolina colleges? The state does not operate one portal for all of the online programs in South Carolina, so you need to conduct your own research to find a program that fits your needs; however, you can start by searching the top online colleges in South Carolina through this guide. You can also check out the online education websites for the state’s two biggest public universities, Clemson and USC Columbia. The online program website for USC Columbia lists individual courses, bachelor’s completion programs, bachelor’s degrees, and graduate degrees. While USC Columbia only offers one online bachelor’s degree — an RN-to-BSN program — it administers several bachelor’s degree completion programs. Students should also check out the online options at Clemson. Clemson mostly offers graduate degrees online, but it also runs a BSN degree. Students can also find several online professional and certificate programs through Clemson’s online directory, plus online courses through Clemson cooperative extension. Students who need financial aid should always apply for federal help through the Pell Grant. In the end, the federal government cannot offer funding to everyone. Luckily, South Carolina offers several publicly funded scholarships for first-time students pursuing bachelor’s and associate degrees. Students pursuing advanced degrees can also find information on scholarships specifically for South Carolina. See below for a selection of these funding opportunities. Dedicated to college-aspiring high school seniors in South Carolina, the Palmetto Fellows Scholarship program offers several thousand dollars in funding each year. Students can apply if they intend to pursue a bachelor’s degree. Eligible institutions include several colleges offering online bachelor’s programs. The state of South Carolina offers the the Legislative Incentive for Future Excellence scholarship for students with plans to enroll in higher education. Students pursuing their first associate, bachelor’s, or professional program may apply. In order to apply, students must meet two of the three following criteria: earn at least a 3.0 GPA in high school courses, score at least 1100 on the SAT or 24 on the ACT, or rank in the top 30% of their class. Another state-sponsored scholarship, the South Carolina HOPE scholarship essentially operates as a lottery. High school students with at least a B average — but who do not qualify for the Palmetto Fellows or LIFE scholarships — may apply. This scholarship offers funding to first-year college students entering a four-year program. This scholarship goes to 200 high school graduates in South Carolina each year. These students must enter college for the first time and plan to become teachers. Candidates must submit their ACT or SAT scores, and must participate in an interview. The fellowship includes several higher education institutions across South Carolina. The Foundation for the Carolinas created the ANSWER Scholarship to nontraditional students — specifically, women older than 25 who raise school-age children. Candidates from certain counties in both North and South Carolina may apply. With the scholarship money, they may pursue a first-time bachelor’s degree, two-year nursing degree, or a two-year degree in health information technology.